When Sherloque suggests using a machine to allow Barry and Nora to enter into the mind of Cicada's adopted daughter Grace in a bid to bring her out of her coma, Nora panics, fearful her parents might discover her secrets. Using the machine on her own, she becomes trapped in Grace's mind, requiring that Barry and Iris go in after her. Meanwhile, in a bid to drag Cisco out of his depression and obsession with making a cure for metahuman powers, Ralph tricks Cisco into a night on the town. The idea that Iris is making enough money off of add revenue for her blog to talk about hiring editors and photographers to start her own newspaper in this day and age will bring a hearty chuckle to every blog writer and newspaper employee in America. It's also disturbing how cheerful Iris is regarding someone dying in a way that profits her. Islie Hirvonen - who places Grace Gibbons - gives a really creepy performance as she explains to Nora that she's been listening and then turns angry as she springs the trap on the woman she thinks is playing nice to trick her into hurting her uncle. The cinematography in the dream sequences is top-notch and Grace's dreamworld becomes downright horrific when she turns upon Nora and her uncle arrives to protect her. The sweater Caitlin wears to go ice skating uses the same design as DC Bombshells' Killer Frost's costume. Sherloque makes reference to using his Memory Machine to help the victims of The Summerholt Institute. In the reality of Smallville, The Summerbolt Institute was a neurological clinic that developed the mind manipulation technology later employed by LuthorCorp. Sherloque also makes reference to using the Memory Machine to fight Jervis Tetch - The Mad Hatter Killer of Earth 221. Jervis Tetch is the real name of The Mad Hatter - one of Batman's more infamous rogues, who employs mind-control technology in various forms. When they enter Nora's memory of The Flash Museum gift shop, there are two boys hitting each other with stuffed animals (a gorilla and a shark), pretending to be Gorilla Grodd and King Shark. It has been suggested that a later episode of Season 5 will feature a battle between King Shark and Gorilla Grodd. We overhear a boisterous voice in the gift shop introducing himself as Dexter Myles and welcoming everyone to The Flash Museum. In the comics, Dexter Myles was an out-of-work, classically-trained Shakespearean actor, who helped The Flash stop a bank robbery in The Flash #138. When the Flash Museum was introduced into the comics two years later in The Flash #154, Barry Allen recommended Myles for the job of the museum's curator and tour guide. Most of the merchandise we see in The Flash Museum gift shop is real world Flash swag. The comic a young Nora is reading is The Flash #172. This was the second comic Cicada appeared in and the first one where The Flash fought him directly. At one point, we can see a copy of the second printing of The Flash #1 from the Rebirth series on a comics rack over Barry's shoulder. We also see a copy of The Flash #39 from the current Rebirth series. The cover declares that "Grodd is Back!" further foreshadowing Grodd's return later this eason. In most coma patients, high traffic areas of brain activity go dormant and the low traffic areas spring to life. Unfortunately, Grace is not normal and her consciousness has isolated itself into one specific region of her brain - her long-term memories. In order to wake Grace up, they will need to guide her consciousness to a neural nexus portal. When traveling in pairs using the memory machine, it is possible for the partners to see one another's memories. There is no way to configure the machine to eliminate this issue. The memory machine requires a transfer disc be connected to the patient's EEG to function. According to Caitlin, an abnormal brain like Grace's might cause her brain to act defensively if it sensed an outside presence. When it detected Nora, it shifted its neural nexus pathways - effectively sealing the exits as a quarantine procedure.The brain also has synaptic defenses that naturally protect it from outside presences. Caitlin is able to use the M.A.D 2.0 to complete the emergency beacon Sherloque wanted to install in the Memory Machine. This allows her to "phone in" to the memory world at least before it starts smoking. Caitlin and Sherloque determine that portals are hidden in perception gaps - things that you remember the way you want them to be, not the way they actually were. The defense mechanisms of the brain are composed of synapses. Breaking the synapses in the false memory will reveal the real memory and the synaptic jolt will expose the portal. Nora: (dictating a letter to Reverse Flash) I want you to think about the biggest secret in your life. The one you keep from the people that you love, or even from yourself. I want you to imagine what would happen if that secret got out. Remember when you asked me that? I've been using all of your training. Studying my pulse, managing micro-expressions, limiting non-congruent gestures, destroying any piece of evidence. I don't know how much longer I can keep this up. And not just because of the risks. But because the closer I get to my parents, the more I feel like I'm hurting them. Cisco: I think we're done here. Cisco: One drink, but only because you never pay for anything ever and I'm really curious to see what Hell looks like frozen over. Nora: Grace, how did you hear Orlin that night? You were in a coma. Grace: Maybe you don't have anyone who cares about you! But I have someone who cares about me, and I'm the only one who can help him! Nora: (dictating a letter to Reverse Flash) It's hard to keep a secret, but it's easier when you're reminded why you're doing it. I met someone who told me that she would do anything to protect her family. She helped me see that so would I. My parents can't know that you're helping me stop Cicada. There's too much at risk. And I'll do anything to protect them. Even lie. Nora never learned how to ice-skate. Ralph's mom dated a Zamboni driver. Sherloque claims there are no Zambonis on his Earth. When they want to clean the ice, everyone has to get down on their hands and knees with a squeegee. Larry Blumenthal - a patent register who has an office across the hall from Ralph - died and his office is now for rent. Iris immediately starts making plans to use this as the base for a new newspaper. There is a Forerunner Multiversal Delivery Service that can deliver things between worlds. They brought Sherloque his memory machine from Earth 221. Ralph makes reference to the events of 423 and how Barry got his mind to take control of his body and throw out The Thinker. Sherloque used to have a partner named Watsune, who traveled with him into many other people's minds. Their partnership ended when Sherloque discovered that Watsune was having an affair with Sherloque's fourth wife. Killer Frost's favorite film directors are John Woo and John Hughes. Cisco prefers the movies of John Ford and John Waters. Ralph asks Cisco to come with him to investigate a lead on Cicada's location. Nora goes into Grace's memories and finds her in a memory of the night she was orphaned after a meta killed both her parents during an ATM robbery. Nora tells Grace that she once had to go to the CCPD headquarters by herself too. Nora is able to get Grace to change where they are in her head by thinking of a different memory. In this case, she encourages Grace to think about what will happen once they get out of her head. This leads them into Grace's memory of her and her uncle planning a day together. Their plans were to go to the zoo, then get ice cream and then go to the fair. Iris learns that the only name her newspaper is cleared to use legally is the Central City Citizen. She tries to avoid this because this was the name of the newspaper from which the 2024 article Iris wrote describing The Flash's disappearance came from. Sherloque says that Watsune died after he tried to go into the Mad Hatter of Earth 221's head alone. The mascot of Central City High is the Squirrel. It turns out the Cicada Ralph's contact knows about is a terrible metal band called "Sickada." Barry and Iris wind up in Nora's memories instead of Grace's when they use the Memory Machine together. Grace notices that the kitchen in her memories looks exactly like the kitchen in her dollhouse. The first memory Barry and Iris see is of Nora alone in the CCPD headquarters. Apparently she ran away from home and jumped a turnstile on the subway. Barry ran away from home several times when he was 10, wanting to go to Iron Heights Prison and see his dad. The second memory Barry and Iris enter is of Nora running off to The Flash Museum by herself, reading comics in the gift shop, before going to the Hall of Villains and looking at the Cicada display. The Cicada display in the Hall of Villains reveals that Cicada reappeared in 2024 shortly after The Flash disappeared. This led to speculation that Cicada was immortal. Cicada's death toll was 152 confirmed victims. This was more people than Zoom and The Red Death. It is said that after Cicada returned, people didn't quite view The Flash as highly as they had before. In Nora's memory, Iris is unreasonably mean to her and says she is never coming to The Flash Museum again after breaking a Flash action figure Iris had which she assumed she stole and making Nora leave it behind. Grace takes Nora into her last memory. Rather than being the fair grounds before she was injured, Nora is surprised to find herself in Grace's hospital room. It is here she discovers that Grace is aware that her uncle has become Cicada and that she approves of him killing metahumans, whom she sees as all bad because they killed her parents and hurt her and her uncle. Grace is apparently able to hear her uncle in her coma and heard him talking to Dr. Ambres about his work and how he believed the new speedster, XS, was The Flash's daughter. This leads Grace to figure out who Nora is to turn her neural defenses against her. Grace's neural defenses take the form of her uncle in his Cicada costume. Nora's neural defenses take the form of the empty Reverse Flash costume in the Flash Museum. 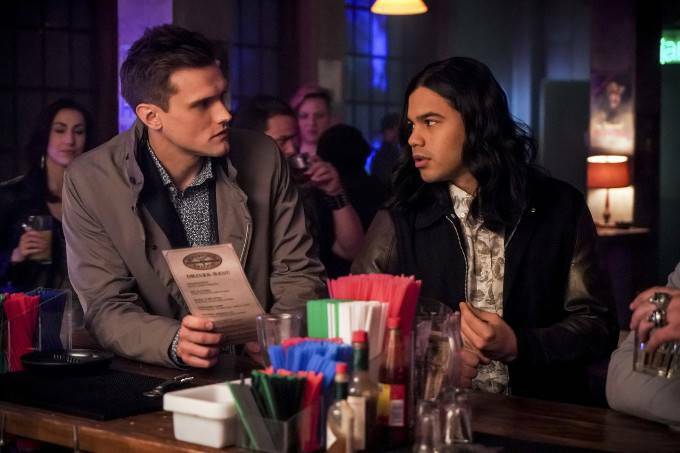 Ralph reveals that the real reason he asked Cisco to go out to the bar with him was that he never really had friends to do stuff with when he was just Ralph Dibny and he thought Cisco needed a night off. While talking with a cute bartender named Kamilla, Cisco has the revelation that if he could find two sisters, one metahuman, the other not, that would enable him to find the genome that controls metagenes. When Nora's real memory of the day she ran away is revealed, we find that her toy broke on accident and Iris was more worried about her than angry. We also discover that Nora had no idea that her dad was The Flash and that Iris had only told her that her father was The Flash's biggest fan. Nora went to the museum because Iris had said the museum reminded her of Nora's dad and she wanted to try and remember him too. When Nora tries to break Grace's idealized view of her last day with her uncle, the kitchen/dining room becomes darker and dingier. When Nora tries to talk to Grace a second time and is attacked by Cicada again, this time Cicada appears to be a young woman in a hooded longcoat and mask. This suggests that Grace is seeing herself as an adult "hero" like her uncle. This may be foreshadowing that the second Cicada of 2024 is a grown up Grace Gibbons who inherits her uncle's metatech after his death. Caitlin discovers a piece of dark-matter infused shrapnel inside Grace Gibbons' brain. She speculates this might have created a barrier that disrupted the Memory Machine. Nora creates a sketch of the interior of Cicada's house based on what she saw in Grace's memory. When Iris, Nora and Barry make it back to reality, they ask Nora why she was afraid to let Barry into her memories. Sherloque covers for her, saying that clearly she was embarrassed about her feelings about her mother as a child. Nora agrees that was it. Barry tells Sherloque that Nora's defense mechanism was The Reverse Flash costume. This does not seem to surprise him. Iris officially moves into the office across from Ralph. Nora discovers that Iris has changed the timeline. In her future, the Central Citizen Citizen was founded in 2021. Now the historical record shows it was established in 2019. Cisco got Camilla the bartender's phone number. Cisco says he found a pair of siblings, one of whom was a meta and the other not. He says he almost has the metahuman cure finished. Barry says he's in favor of using the metahuman cure on Cicada. Sherloque makes reference to having helped the victims of the Summerholt Institute and fighting the Mad Hatter of Earth 221. A solid episode where the creepy kid villain honestly is creepy and villainous. Great direction and set design also help to sell the story. A high point of the season so far.